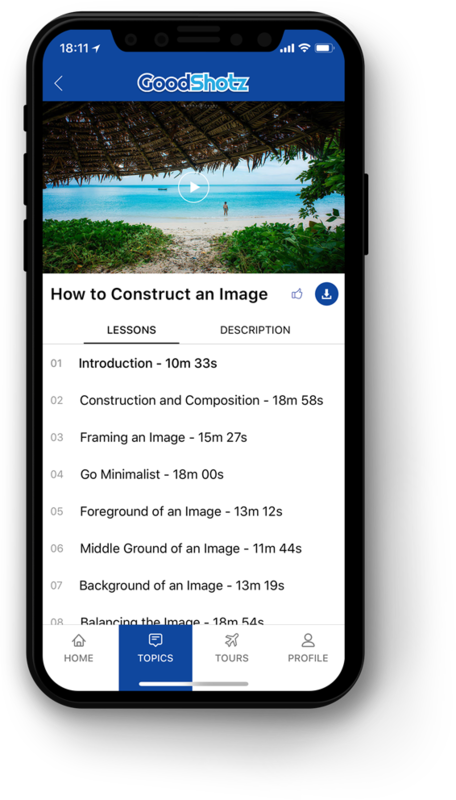 iLearn Courses are divided into two sections — Photography and Post-Processing. Both sections contain curated video lessons per course, and run for many hours. These lessons are created for all kinds of learners—Basic to Advanced. Stream unlimited on GoodShotz website and download the lessons on our app for offline viewing. Get exclusive Photoshop Actions designed by GoodShotz. Make your workflow smarter and better. Download the iLearn app for Android and iOS mobile phones to download the lessons and learn on the go. All iLearn Members can e-mail us their queries related to the lessons and we will respond back via mail or phone. GoodShotz offers special discount to iLearners for the Photography Tours. Implement your learning on-the-field. Get special discounts on Haida Filters. Get special discounts on Samyang. Get a chance to work with GoodShotz.